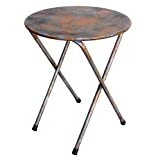 Enjoy the sun, fresh air, a great cup of coffee whilst you chill out with this rustic bistro table. Chairs (offered in red, blue and green) and the table (accessible in rustic blue-grey hue only) are also sold separately or in a set. Basically search \"NACH bistro\" on amazon to mix and match chairs of distinct colors to produce an eclectic set of your option.